Competition is at the heart of any game. Indeed, it’s a characteristic that often defines the very word “game,” and separates the board gaming hobby from other leisurely forms of entertainment. In some games, this is manifested in a cooperative element where players work together to beat the system. Others instill a style of competition in which you solitarily strive to better your opponents at the same task, independent of any influence from each other. But the greatgames include some form of direct interaction. I’m going to attack you, steal from you, lie to you, block you, gang up on you, or generally wreak havoc on your pretty, well-laid plans of building a quiet cottage in the mountain meadows where the larks sing you to sleep in a gently swaying hammock on a warm spring day after sipping your sweet tea with mint. Some people really like their sweet tea. But, if you’re a gamer who appreciates direct interaction – even some old-fashioned, sucker-punching spite – just how do you entice wary casual gamers, younger children, or maybe even that hard-nosed Euro player in your group? Well, you’ll have to ease them into it, of course. So before you hit them with Bang!, Cosmic Encounter, or Diplomacy, here’s a list of ten progressively recommended titles to turn your peace-loving friend or relative into the Gordon Ramsay of gaming! The Skinny: This simple – and silly – card game is all about talking smack to those beneath you! A variation on the traditional game President played with a 52-card pack, the point is to go out first. One player leads a set of cards and following players must beat it or pass. To beat a play, you must have a set of lower numbers in an equal amount. So if someone plays four 10’s, you must play four 9’s, or 8’s, or 5’s, etc. That’s the simple. The game also has a social hierarchy. 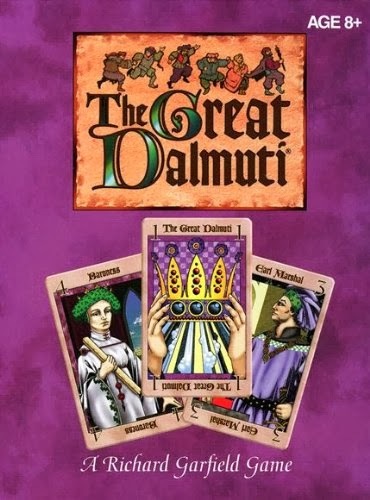 The player to go out first becomes the Greater Dalmuti for the next round, followed by the Lesser Dalmuti, some Merchants, and on down to the last player, the Greater Peon. The Greater Dalmuti may then make all sorts of laws and demands upon his social lessers to chaotic effect. That’s the silly. The Appeal: The Great Dalmuti is a good introductory foray into the world of spite and interaction, because it’s very light and tackles it in a party game atmosphere. Plus, it’s familiar as a basic trick-taking game and could even be played with a couple of regular decks of cards, ala President. Taxation is one spiteful element in that the Dalmutis can force the Peons to trade a card or two. As a Peon, it’s already hard enough going last! Second, the laws are hilariously malevolent, forcing all kinds of arbitrary mischievousness on those unfortunately down the social ladder. Great for all ages and social occasions – just keep those laws family friendly when necessary! The Skinny: This is a light romp where you try to steal your opponents’ chickens through bluffing and deduction! 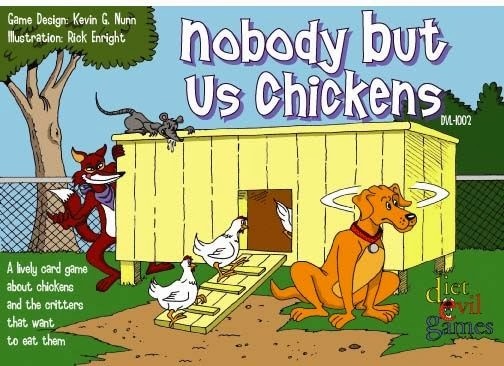 Each player has the same hand of cards – some chickens worth varying points, a fox, a dog, and a rat. Everyone plays one card secretly to the “chicken coop” and then they’re all revealed simultaneously and resolved in a rock-paper-scissors fashion. Play your cards right and sneak off with all the fat poultry while leaving your friends with a whole lot of nothing! The Appeal: Nobody But Us Chickens may seem a bit chaotic, but the interaction is purely player driven. And being out-smarted is one of the more frustrating feelings in gaming. This design is not terribly spiteful, so it’s a good one with which to ease into forms of more direct interaction. Plus, not only is it accessible to young kids, but they can play on their own footing against adults. And being out-smarted by a kid as an adult can be rage inducing! The Skinny: This small, whimsical card game plays a little bit like a trading card game. Your goal is to collect the most of the fictional title creatures, while attempting to destroy or steal them from your opponents. Of course, you’ll need to protect the ones that you have from other players bent on similar intent! 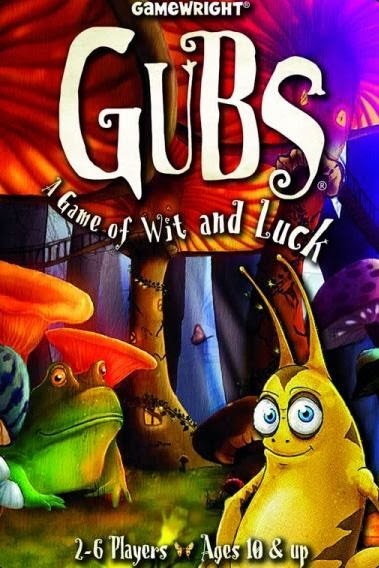 Cards are either gubs, or ways to defend, attack, or otherwise endow you with special abilities. Use them all well to earn the title Best Entomologist. At least, I think they’re bugs? The Appeal: Gubs is certainly a step up on the spite ladder with its direct attacks, but it’s not overwhelming. This is mostly because it’s really light and plays pretty fast, both with individual turns and the overall game length. Interaction is appropriate in terms of frequency. Attacks never really seem to inundate any one game. The opportunity to both harass others and guard your own cards is pretty balanced. Luck of the draw keeps all players on equal footing. While it’s accessible to younger kids, make sure they read well, as many of the cards have textual instructions. Plus, older kids should be more equipped to emotionally handle the growing number of carcasses piling up in the gub cemetery! The Skinny: This chaotic, bar-brawling simulation radiates with charm and frivolity, despite the fact it’s about punching other people in the teeth! Playing a character with a unique ability, you furiously play seven cards – and only seven – against your opponents. When everyone has played, you count up the cards placed by each character. These represent hit points. When the total hit points match that character’s health rating, he’s knocked-out and the player who landed that penultimate blow earns points. So you can easily play your cards too early or too late, just leaving you gasping for breath. 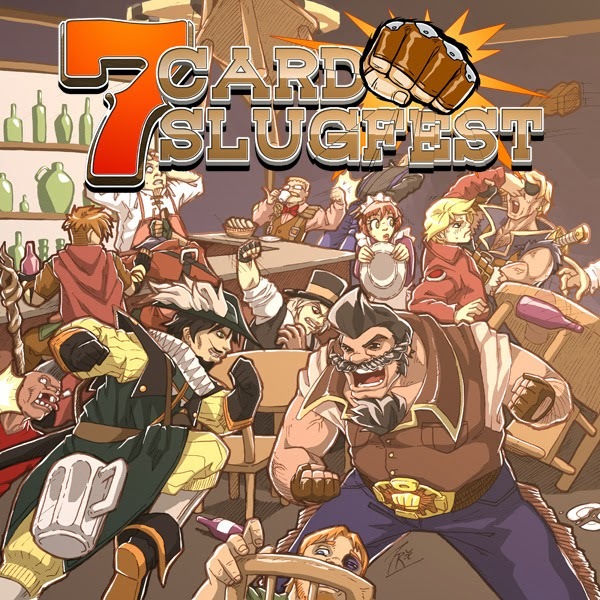 The Appeal: So 7-Card Slugfest is brutally interactive by thematic nature. However, it has one central element that dampens most of its abrasive contentiousness: speed. The first players to go out get first choice on available bonus tokens that add health points to their characters. If you’re too slow, you’ll get stuck with a penalty token, instead. So people are laying down punches fast and furiously. Now, there is a little logic to placing cards based on your unique powers, but typically things are moving so fast, you get caught up in the fun and never take things personally – even though your sister-in-law just sucker punched you in the jaw! The Skinny: Another chaotic and frenzied board game – this time you’re programming robots in a frantic, cutthroat race. Each round, you choose five movement cards from your hand to program the direction and distance you want your bot to travel. Then everyone reveals and resolves their first card, then the second, and so on, so by the time you get to your last program card, your robot could be careening off completely in the wrong direction. The course is littered with so many obstacles and hazards that just surviving can be a victory in itself, let along crossing the finish line! The Appeal: Robo Rally’s interaction is definitely sharp, direct, and more damaging – but, like 7-Card Slugfest, it’s also funny, fast, and random. There are some decisions in programming your robot, but there’s also enough chaos to ram that programming down your face. Besides the in-game obstacles, there are three elements of player interaction. You can bump an opponent off course – either on purpose or by accident. You can fire a laser at other robots – take too much damage and you lose a life (you get three). But most interesting of all, the first player to program their movement then starts a 30-second sand timer in which everyone else has to frantically finish programming – or they just end up with random cards! 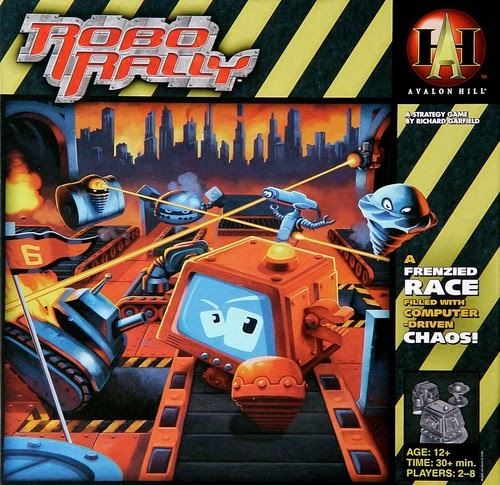 Robo Rally’s spite and interaction is really the joy of the game and a hoot to watch unfold, even – no especially – as laser bolts reduce your robot to a pile of so many bolts and circuits! 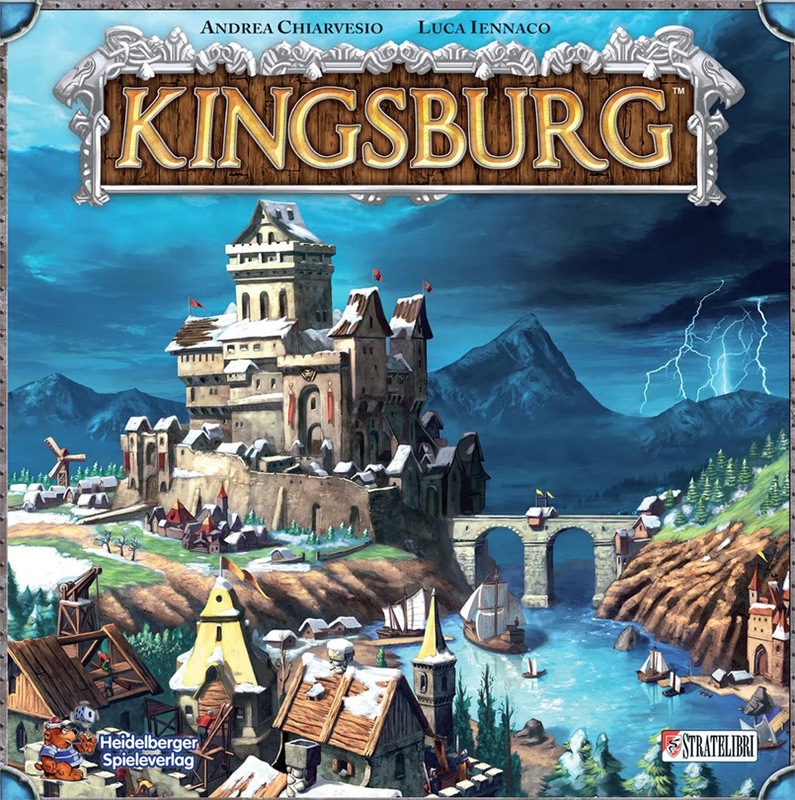 The Appeal: Kingsburg is technically a worker placement game, a design in which you use some sort of physical component to claim a space on the board which grants you an action, ability, or resources. The majority of titles within this genre are not heavily spiteful, but they do have one interactive aspect which can be fun and frustrating – “blocking.” That is, typical spaces in worker placement designs allow for only one player to claim. Therefore, an opponent can beat you to a spot and deny you its benefits, sometimes just because they know you need/want it! This passive/aggressive strategy is usually calculated when employed. And while it can be maddening, the upside is that you don’t actually lose anything. It’s not uncommon in the hobby, even in longer, more peaceful Euro games, so you might as well get used to it – and this is a simple, accessible design well suited to that end. The Skinny: Rebuild revolution-torn Cuba in this abstractly themed role selection game by collecting nondescript resources to build generic buildings. Each player has the same set of role cards and each character allows you to collect certain resources and/or provides a special ability. Pick two each turn, but you must discard one when finished, with only a limited ability to retrieve used roles for later use. Some of these roles let you mess with your opponents. Two characters let you steal pesos or building material. Another forces players to discard resources. A fourth grants the ability to trash an available building tile that another player may want. But turn order changes based on role selection, so those spiteful attacks may end up earning you a whole of nothing! 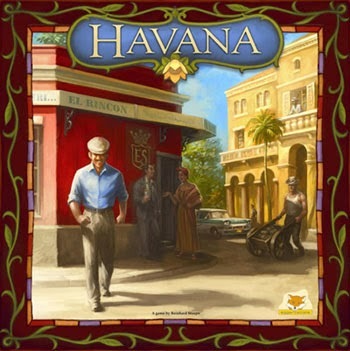 The Appeal: Havana is a light, accessible, and smooth design nearly perfect for three players. The spiteful interaction here is a nice step up because it is sharp and direct and will set you back. However, it’s not insurmountable, nor frequently crazy. It tends to be more tactical in nature and can be further softened by turn order. The Tax Collector forces players after you to discard a resource. So if no one follows you, then part of that character’s ability is wasted. The two Thieves allow you to steal half of the pesos or materials, respectively, from the next player. If that individual is broke, then you don’t get much. However, if you’re the last player, you can pick any other person to filch off of. Add to that a role that offers some protection, and you have a good design to acclimate players to spite. Plus, be glad the game doesn’t include any of Castro’s jack-booted thugs! The Skinny: This is a humorously fantasy-themed war game that doesn’t use dice. Instead, combat is determined by simple math: if you have more troops than your opponent, you win. Movement and control are still standard in that both are area-based. The distinctive element to Small World revolves around the unique race you play. You’ll get to control more than one through the course of a session; and these races change every game by randomly pairing with a unique trait that gives them a second special ability. So if you ever wanted to be a Diplomatic Troll, now’s your chance! The Appeal: Small World is a stripped-down war game, so it is confrontational by definition. Thankfully, its simplicity makes it accessible to casual gamers and even children, though I recommend no younger than 3rd grade. Rather than a game about eliminating your enemies – in fact, there is no player elimination – victory is points-oriented. Your race’s attributes and unique trait will dictate which regions you want to takeover in order to maximize points. This strategy really tempers the spite. Victory points are also hidden, so the common “gang up on the leader” effect is rarely an issue. Plus, games last a concrete number of rounds. So, time forces you to be efficient, rather than personal; and peace will always be on the horizon…until you set it up all over again! The Skinny: This social game is all about arguing, lying and sabotaging missions – or figuring out who’s trying. 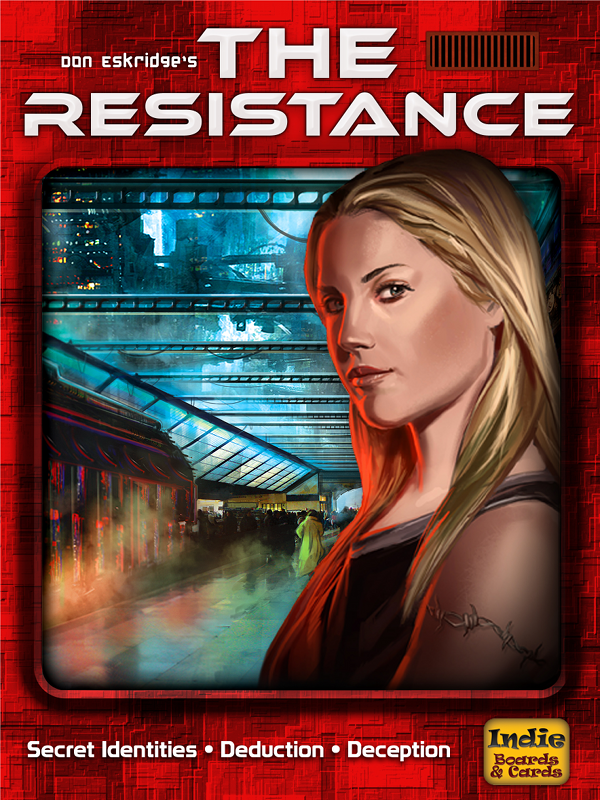 All players receive a role as either a resistance operative or a spy. Spies know who is who, but members of the Resistance do not. The game is a series of missions where everyone argues about, and then votes on, who gets to go on a mission. When that’s decided, the mission team plays cards to either pass or sabotage it. When three missions succeed, the Resistance wins. When three fail, they lose. No matter what team you’re on, you’ll need to bring some tall accusations and sound convincing! The Appeal: The Resistance is a simple concept, but it’s active interaction requires a little more player engagement. That is why it’s higher up on this list. Completely social in scope, the “game” is all about convincing players who to vote for or not. As such, it will intrigue fans of reality competition shows like Survivor, Big Brother, or the Bachelor. And while no one likes to be voted out, there is no elimination in Resistance. Even if others sort of figure out who you are, you can still participate in the game’s wild campaigning! The Skinny: Another card game, players try to earn money and build the best medieval city. The game’s heart and soul, however, is in the card drafting mechanic in which everyone selects one of the eight roles. Each character has a special ability; and turn order is always resolved by role in the same order every round. The fun part is that roles remain a secret until time for a character’s turn. Four of these characters are a bit seedy…and spiteful. The Assassin can choose another role to kill off – whoever picked that character loses their turn! The Thief can choose another character and steal all that player’s gold. Meanwhile, the Magician can force another player to trade hands, while the Warlord can destroy part of another player’s city – for a cost. Not all roles will be in play every round, so there is always some guessing. The Appeal: If you’re on the receiving end of one of Citadel’s attacking characters, it can be jolting. But the beauty of this design is it’s never personal. 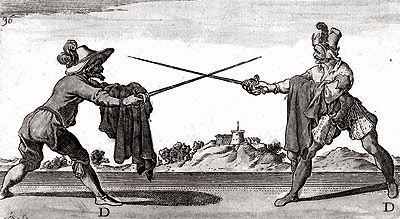 The Assassin and Thief must choose a character, not a player, and so sometimes whiff at air or pick the wrong target – to teasing taunts by all. Meanwhile, the Magician and Warlord usually have logical, game-related reasons for choosing their targets. Besides, you’ve acclimated your peace-loving gamer enough with titles lower on this list, so they should be able to handle this Big BoyTM step up, by now. 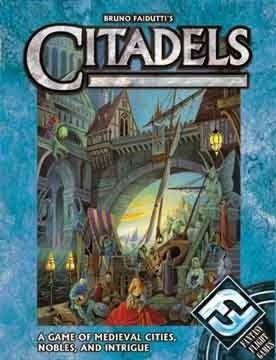 There are many games more spiteful than Citadels, but this classic is by far the most abrasive here – and is a good choice to launch your friend or relative with his/her new found love of interaction into a broader world of cutthroat and back-stabbing delight!